This page is intended to provide a gentle introduction to the York Corpus Christi Play, so that readers may better understand the significance of the computer study I conducted (Pageant Simulator 2.1). It is also the document I would have liked to have been able to read, before I began my own study of the York plays. Experts may find parts of this document naive; students of Prof. Alexandra F. Johnston at the University of Toronto may find parts of it familiar. The outdoor theatrical event in the medieval city of York, England, known to its performers and audiences as the “Corpus Christi Play,” is a collection of brief religious plays that together represent the story of Christian salvation. The York cycle is one of four that have survived in more or less complete form. The others are known as Chester, Wakefield, (after the cities where they were performed) and N-Town (now identified with no known city, but formerly identified as Townley). The York cycle was performed nearly every year, on the feast of Corpus Christi (Latin for the Body of Christ). The plays were already an established tradition in the late 14th century, and they continued in one form or other (weakened by Protestant censorship) until the mid-to-late 16th century.Nobody knows who wrote the plays, or even how many authors there were, although the group of plays describing the Passion seems to bear the stamp of an exceptional dramatist now called “the York Realist.” The plays date from the time before England’s separation from the Church of Rome; as such, they emphasize the sacraments and rituals of the Catholic faith and urge people to salvation through active membership and participation in the community of worshippers. Since the plays were performed as part of a day-long celebration of Corpus Christi — the presence of the Body of Christ in the sacrament of the Eucharist — they upheld the authority of the Church as a theological and moral guide for living in this world and the next. To begin to understand the popularity and significance of the Corpus Christi plays, we must first recognize the significance of the feast being celebrated. During the early middle ages, as church architecture and artistry moved away from the conservatism necessitated by its beginnings as a renegade faith in a Pagan world, and as the rituals surrounding Christian worship grew more intricate, the interior design of churches evolved. As the churches grew in size, the altar grew more elaborate, and the people moved proportionately farther away from it; communion rails developed because it was inconvenient to have crowds rushing the ornate altars to receive the Host. These rails eventually developed into a screen of bars or wooden slats, behind which the priest would say the mass. In addition, the priest and the congregation both faced the tabernacle on the back wall, the end result being that the priest blocked the people’s view of most of the mass. Over generations, the faithful began to associate the unseen elements of the service with an air of mystery. Only when the priest lifted the consecrated wine and bread over his head in prayer — a gesture known as the Elevation — did the people get a clear view of the action. Medieval drama served as a religious outlet; and, in an age when most people were illiterate, took an important place alongside stained glass windows and statues in spreading the Christian message to the general public. For instance, the play depicting the birth of Christ includes a long monologue delivered by a learned man directly to the audience– it is a sermon explaining the significance of Old Testament prophecies that point to the Nativity. The speaker ensures that the audience understands everything they need to know in order to appreciate more fully the significance of the events that the actors are about to portray. The actors then, become living icons, windows into the spiritual realm, which never seemed very far off to the medieval mind.During the early part of the Corpus Christi period, the Corpus Christi plays were part of a larger celebration on the feast of Corpus Christi. The community leaders, including the religious authorities, the elected town officials, and the masters of the guild, assembled for a pre-dawn torchlight procession in honor of the Body of Christ– a consecrated host was carried at the head of the procession. The play wagons would follow behind. The York pageant was completely interwoven into society. Throughout the year, the elected officials — known as the City Fathers — used the York play as a way for the local government to regulate business. For instance, when the merchant guild imported leather, impinging on the tanners’ livelihood, the merchants were ordered by the city officials to pay a fine; half of the fine went to the city, and the other half went to pay the tanners’ expenses for mounting the next year’s pageant. Similarly, if a guild defaulted on a play, caused delays or disorder in the procession, or if a clergyman or burgher failed to show up to take his part in the procession, fines for these infractions went to the next year’s production.In the York plays the past is a direct continuation of the present: Moses swears by the cross; Pilate calls his soldiers knights; everyone wears medieval garb. No attempt was made to hide this anachronism because nobody minded — medieval people did not think of the world of the Bible as different from their own. Because each play was produced by a guild, there was a competition among the guilds to produce the best play. The guilds were economic, social and often religious groups, tied together in that unique medieval way. Within the plays are obvious and more subtle mercantile messages. For instance, the play of the construction of Noah’s ark was produced by the wainwrights, or shipbuilders; Noah was probably played by a well-known shipbuilder, employing his craft with talent on loan from God. In the play put on by the cloth dyers, Jesus is dressed in white, which one of the mockers calls the color of fools — suggesting, in essence, the audience members are fools unless they pay to have their clothing dyed. The winesellers did the (now lost) Wedding Feast of Cana, the Bakers did the Last Supper, and the Chaundlers — who made candles and chandeliers — did the play with the Star of Bethlehem. The Mercer’s wagon for the play “Doomsday” included special effects — a pulley-operated platform that Christ rides up and down from heaven; smoke for a gaping hell mouth, into which the sinners were thrown; miniature angels that seemed to run around the heavens in a circle; and of course, costumes, music, and a choir of voices. Although scholars used to think that all of society revolved around the guilds, the guild structure was largely undeveloped before the Black Death (14c). Modern Marxists imagined the guilds were labor organizations, developed by the rising working class to protect their economic and political rights. More recent research suggests that the guilds were formed by the city officials in order to organize and control various conflicting business interests. They were run not by workers but by the bosses — master guildsmen who controlled who was hired and who got training; these masters aspired to be landlords and city officials, and moved freely in these circles. For the few at the top of the guild structure, the York Play might have been part of a class struggle being waged in the city. The working class did have its own organizations, called “Fraternities.” These were similar to the modern JayCees, Knights of Columbus or Shriners; they were attached to a specific parish and focusing on charity — an enormous amount of which was needed in the days before large-scale government social programs. To modern Christians, the term “religious theater” tends to conjure up images of terrified but cute kids wearing dishtowels on their heads at Christmas time, or silly-looking adults playing guitars and singing with puppets. Because the feast being celebrated is named for the body of Christ, the York plays emphasize the importance of that body, dwelling on its actions, its symbolic significance, and, of course, its death and resurrection. Many Protestants will be uncomfortable with the play’s presentation of Christ’s suffering, as well as the implied and direct significance of “the body of Christ” and its relationship to the bread and wine offered during Christian worship.A colleague of mine recently rolled his eyes and moaned in mimicry of traditional paintings of Christ’s passion, calling such images “offensive” to an Evangelical Protestant mindset. During the Reformation, all artistic reminders of the medieval church, and the public’s lingering attachment to them, constituted grave threats to the new Protestant order, prompting Protestant reformers to act quickly to suppress them (see Eamon Duffy, The Stripping of the Altars: Traditional Religion in England c. 1400-1580). As a result, many protestant denominations have all but lost what was once a popular and powerful devotional tradition: affective piety — a religious zeal which affects the emotions, by way of statues, images, and devotional legends which expound upon core religious messages. (See “Affective Piety,” below). The Philippines example may be extreme; however, affective piety was an important part of medieval religious instruction, designed to stir the personal devotion of people living in a society that took religion for granted. 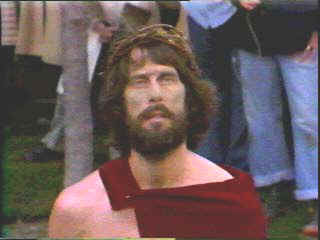 In their private chambers, using a picture, a statue, or spoken prayers to feed their spiritual imagination, the devout entered into the suffering of Christ, a martyr or some other holy figure with a psychological totality that we today would probably describe as a very extreme form of method acting. Many modern Christians may be tempted to dismiss or ridicule such devotional practices, yet these same critics may have no problem with the idea of responding with powerful emotion to contemporary religious music or extemporaneous spoken prayer. Meanwhile secular culture provides many opportunities for people to cry over the imaginary troubles of soap opera characters, or to cheer or curse a televised sporting event. In the absence of television or recorded sound, the medieval faithful responded in much the same way to icons, statues, or music or dialogue from live performers. For more on affective piety, see “‘Crucifye hem, Crucifye hem’: The Subject and Affective Response in Middle English Passion Narratives“, by Laurelle LeVert (a former classmate of mine). Did the plays spring up as a result of the Corpus Christi celebration, or did the plays already exist in some form before the feast was declared, so that an existing form contributed to the eventual shape of the new festival? The question remains open. In either case, neither the plays nor the celebration would be the same without the other. Corpus Christi Plays were extremely popular in Northern England; however, in Europe, the most lavish productions were reserved for Passion plays — Easter celebrations that dramatized the events immediately around Christ’s Crucifixion. Why is it that Easter celebrations were not as elaborate in England? The reason no doubt has much to do with the difference in climate between England and the rest of Europe, and with the date of Easter. The liturgical calendar sets the date of Easter according to the occurrence of the first full moon after spring, which usually places Easter in March or April. At that time of the year, it is warm enough in Southern France or Spain to attract great crowds to an outdoor celebration, but it is usually still too cold in England. The date the church chose for Corpus Christi Day was the Thursday after Trinity Sunday, or about seven weeks after Easter. The existence of a festival to coincide with the onset of warmer weather no doubt contributed to England’s affinity for celebrating Corpus Christi. The plays were a communal event that everybody participated in, one way or another — the church, the guilds, the city officials, and the tourists. The citizens of the town of York felt honored to participate — they also made a hefty sum from the visitors who came from all across the countryside to see these plays, which were top-notch entertainment, including music, song, costumes, and in many cases lavish special effects. They were also, in many cases, overtly preachy, because the church authorities knew that performance was a great way to get its message across to a public that was largely illiterate. The surviving York manuscript of 48 plays (with a combined length four times that of the longest Hamlet text) and the civic and guild records of the town of York give us much information on the nature of those productions; they were complex productions that required careful planning and great expenses. Disputes were common among the many different groups involved, and violence occasionally broke out. Performed back-to-back in one location, the 48 surviving episodes of the York Cycle would last about 13 hours. The staggered performance times, distances between the performance stations, and the uneven lengths of the plays meant that frequently the actors would spend time moving their wagons or waiting in line for their turn to perform– all of which extended the overall event’s duration considerably. (See Staging the York Plays: The Scholarly Debate). Prof. Alexandra Johnston (University of Toronto) reports that, being a good Protestant (and therefore suspicious of the non-Biblical embellishments to the York play), she checked every one of these dramatic or thematic additions, and — much to her surprise – she found that each addition was supported somewhere in the writing of the very early church, whether in a sermon, a scriptural commentary, or in some devotional work dating from perhaps the third or fourth century. By chance Johnston came across an inventory of the library of the Augustinian Friary in York, which was located near the City Council buildings. Every work that supported the non-Scriptural York material was represented in that library list. All the information required to produce these plays seems to have been immediately available in this monastery, next door to the city council. She imagines the mayor and his neighbor the abbot striking up a friendly conversation that led to the development of the York plays. Other theories include the idea that the plays started out as modest, silent scenes acted out by actors posing on a wagon — much like the “floats” of the Thanksgiving Day parade in New York or the Santa Claus Parade in Toronto, and that these plays gradually expanded to their present form. Historical documents consistently support the idea that the whole event, even at the time of the earliest references to it, was a major production involving significant expenses, suggesting it began with a bang, not a whimper. The Records of Early English Drama is “. . .a project intended to locate, transcribe, and publish systematically all surviving external evidence of dramatic, ceremonial, and minstrel activity in Great Britain before 1642. REED grew out of the 1973 Modern Language Association meeting in Chicago when an international group of individual records editors met and agreed that a wholesale attempt to edit all the extant sources should be inaugurated before they suffered further deterioration, dispersal, and misconstruction. Such a project began to be organized under Professor Alexandra Johnston as Executive Editor and in March 1976 REED was awarded a Major Editorial Grant by the Canada Council. . . ” (excerpted from the program printed for the 1977 York Cycle). Since then, the REED project has been putting out about one book a year, each time publishing the performance-related details of a particular city. 1376 Unspecified playbooks and a bookcase (possibly to hold them) mentioned in a will. 1376 First record of rent paid for the storage of three Corpus Christi pageants (wagons) during the off-season. 1386 Guild officials first recorded collecting “pageant money” from the members — this was a membership fee, used to finance the guild’s contribution to the pageant. 1387 Four different guilds squabble over their share of a pageant, in a dispute ultimately settled by the city council. 1388 First record of a pageant fine — paid half to the city council, half to the support of the next pageant. 1394 First specific record of “stations” — and here they are described as “ancient,” which likely meant at least a generation or two before. 1399 Records express concerns about rowdy crowds, pushing and shoving during the performances. 1426 An itinerant preacher named William Melton, who once threw Margery Kempe out of a church, decried the plays as occasion for drunkenness and wantonness. He suggests that the plays take place on the day after Corpus Christi, so that the religious procession would not be upstaged. 1436 It was not the plays, but rather the procession that was moved. The plays continue on the actual feast day, but the procession is shifted one day earlier. The plays had become an unstoppable force, arguably overshadowing the original purpose of the holy day. For this event, the entire village, parish or town assembles in finest dress. The Procession is comprised of clergy, special guilds or groups, and families. Often children in First Communion dress precede the Blessed Sacrament dropping rose or other flower petals to create a carpet for the approaching Eucharist.